Recently, the Grammar Chic blog has really harped on the idea of creating and following an editorial calendar. We believe that it’s important to establish a plan and a schedule for your content marketing campaign—to decide what you’re going to post well in advance of actually posting it. The clear implication of this is that you’re not always going to be posting “newsy,” time-sensitive content; much of what you post is going to be more timeless, steady in its relevance and appeal. In other words, you’re going to be posting evergreen content. If you’re still fairly new to the world of content marketing, this term may be unfamiliar to you—but it’s vital that you cozy up to it ASAP! Evergreen content—according to most any content marketing professional you’ll find—is a key component in any blogging or social media endeavor. Evergreen content essentially refers to content that is not particularly time-sensitive—content that will remain relevant to your audience over a long period of time, largely unaffected by trends or current events. Evergreen content never goes out of fashion, so you can write it and post it at any time—allowing you to streamline your editorial calendar and fill your blog or website with content that content that will prove interesting year-round. 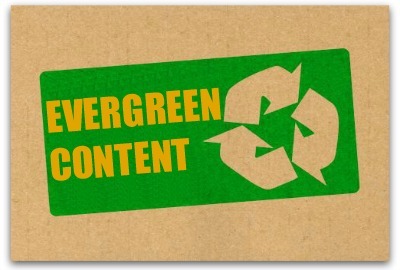 What are the Advantages of Evergreen Content? Indeed, there are many advantages to investing in evergreen content. One of the main ones is that it removes some of the pressure of having to write timely, up-to-date content week in and week out. It brings flexibility to your content marketing schedule, and it also provides you with a sustainable, long-term content strategy: A piece of evergreen content can be shared and posted regardless of trends and current events, so it can potentially offer you steady website traffic. Additionally, you can periodically use evergreen content as social media fodder, really getting a lot of mileage out of a single piece of content. How is Evergreen Content Created? The entire point of evergreen content is to offer your readers something that will be interesting and relevant to them throughout the seasons, so ensure that the content is written with your end user in mind, conveying immediate value and benefit. You might look to what the top posts on your blog currently are, to see what kind of topics people care about. Also make sure to pay attention to questions that your readers are asking you, to help guide you toward relevant evergreen topics. While evergreen content may need to be updated or refreshed from time to time, you don’t want it to become dated too quickly—so avoid referencing current events or brand new studies, when you can. You don’t want your evergreen content to get lost in the shuffle of your timelier blog entries and content updates, so consider including a sidebar on your blog where you link to some of your most popular evergreen posts. Promote your content! Evergreen content can serve as social media fodder, so periodically (every few months, maybe) share a link to your article on Facebook, Google+, Twitter, and so on. To learn more about the benefits of evergreen content, please reach out to the Grammar Chic, Inc. team today! Visit www.grammarchic.net, or call 803-831-7444 803-831-7444. Tagged as Content Marketing Advice, How is Evergreen Content Created?, professional writing services, Social Media Content Management, The Secrets to Creating Evergreen Content, What are the Advantages of Evergreen Content?, What is Evergreen Content?